I had mentioned in one of my previous post that a spicy chicken curry is well appreciated in my family. The good news is that my little one is also enjoying the spicy Chicken curry these days. So I am motivated to experiment with new Chicken curries. Kadai/Kathai Chicken is a popular dish served in Indian restaurants. People who make frequent visits to Indian restaurants might have tasted it at least once. They are super delicious and spicy enough to keep you crave for more. The name Kadai/Kathai/Karahi Chicken is derived from the utensil in which it is cooked. Chicken is prepared in a Wok (Kadai) with freshly ground tempered spices and topped with bell pepper and tomato puree to make a flavorful and juicy Chicken curry. They are typically served in copper bottom kadai in Indian restaurants with rice or naan. The aroma of this curry is simply irresistible. I made this Chicken curry couple of weeks ago and I served the lunch to the kids before the curry was ready. Kids patiently waited for me to finish the photo shoot to start digging into the curry. My daughter even volunteered to model for couple of shots to make the things go faster. Finally they got to taste the Chicken with rice and yogurt with some veggie dishes on the side. We loved the curry so much that we ate the curry without any sides. The chicken was juicy and delicious with the proper balance of tempered spices. 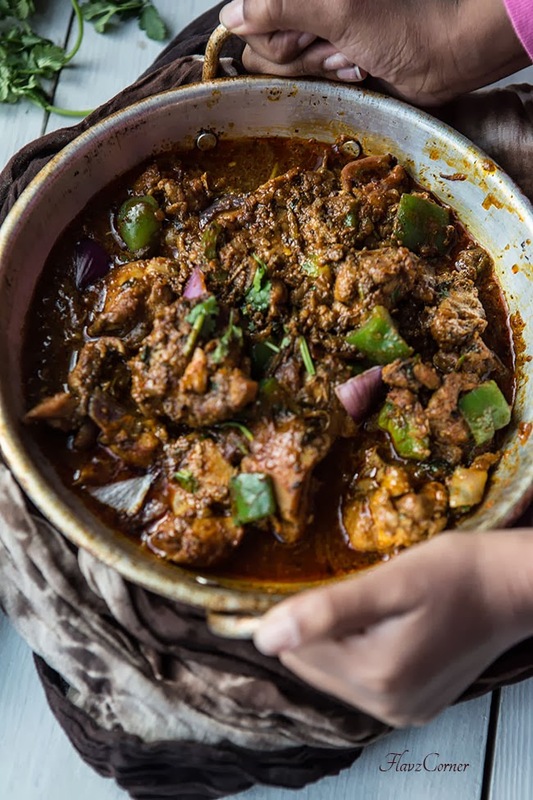 If you have never tried making your own Kadai Chicken, then I encourage you to do so. So what are you waiting for, roll your sleeves and get started!!! Dry roast the ingredients in the Kadai Masala list except fenugreek leaves in a pan over medium heat for 2 minutes by mixing with a wooden spoon. Turn off the flame and add the fenugreek leaves. Let the roasted spices cool. 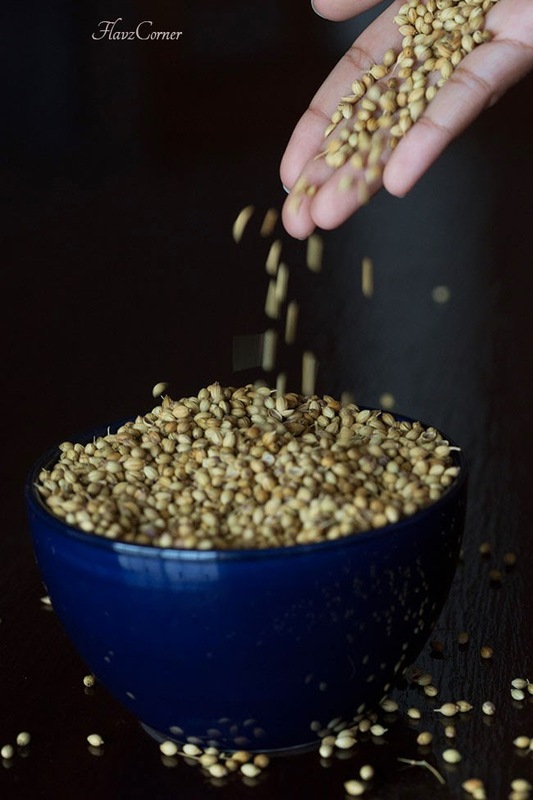 Using a food processor or mortar & pestle coarsely ground the spices and keep it aside. Keep 1/4 tsp of Kadai Masala separate for garnishing. In a cast iron wok or non stick pan, fry the cumin seeds and red chilis in 2 tbsp oil. Add chopped onion, garlic ginger paste and salt. Cook till the onions are translucent and there is no raw smell of ginger & garlic. Add turmeric powder, Kashmiri Chili powder, rest of kadai masala and chicken pieces to the wok and cook for 15 minutes covered. Now remove the lid and add the tomato puree. Cover and cook till the chicken is completely cooked on medium heat for 10 - 15 minutes and the gravy is thick. Add the 1/4 cup heavy cream (if using) and mix well. Remove the lid. Add the cut onions and green pepper. Stir them well into the chicken. Turn off the flame. Rub the 1/2 tsp fenugreek leaves between your palms and add to the chicken. Sprinkle the 1/4 tsp kadai masala and chopped Cilantro over it. Serve the Kadai Chicken with rice or Indian flat breads like Naan, Roti or Chapathi. Don't skip dry roasting the kadai masala, it gives the unique flavor to this dish. The dish is spicy, so adjust the peppercorn, chili powder and red chili according to your taste. Addition of heavy cream brings down the spice level of the curry. Don't skip the dry fenugreek, it enhances the flavor of this dish. Really this is such a flavorful curry and much loved at home too :-) Great pics shibi! I appreciate the chicken curry as well!!! Delectable and inviting chicken curry.....wonderful clicks! Hmmm...yummm it looks....vaayil kappal oddunnu....I can't believe everyone waited patiently for the photo shoot to end to have that yummy looking curry...:)...love that second shot ...well captured..
Wow. This looks fabulous. I've had versions of this dish before, but have never made it myself. I gotta try it! Thanks. Kadai chicken looks delicious lovely clicks. 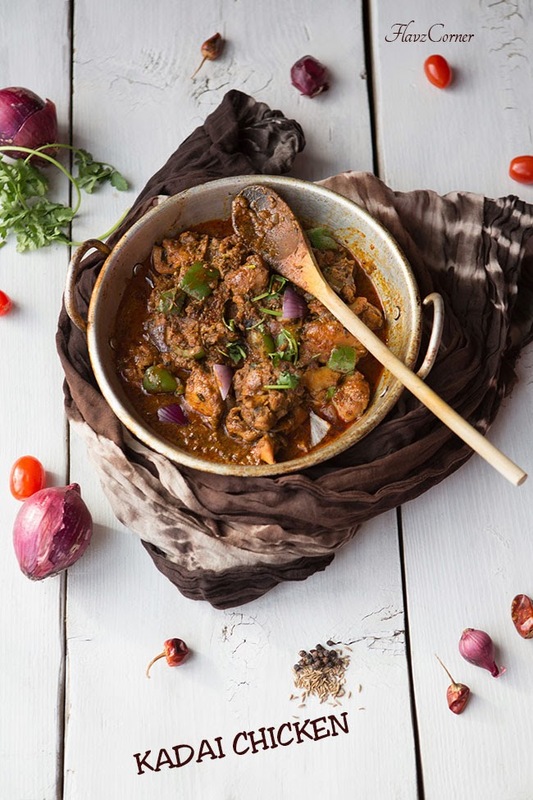 Kadai chicken looks absolutely yumm.. Love it to the core. First time here. Glad to follow you. Do visit mine if you find time. Ohh the pictures you have posted !! even a pure vegetarian like me would get tempted to have a bite !! The last one is just so good and crisp !! Love it ! You could skip the bell pepper if you choose to, that will not make much difference in the taste I believe. I just finished dinner but after seeing this post I am hungry again. Your chicken looks amazing! Wow..very tempting and mouth watering dear :) Very happy to follow you dear..Will be happy if u follow me back !! Oooooo..drooling here seeing all the masala on the kadai love the close up shot with ur daughter's hands, gives such a homely feel. Love curries! This looks so warming and comforting... and all the different spices make for such a complex tasting dish. Yum! Just give me some naan and I'm all set! !